SURVEYOR'S SAY:How to prepare your boat for a Marine Survey. Thinking of Selling? FREE Market Evaluation! Wm. 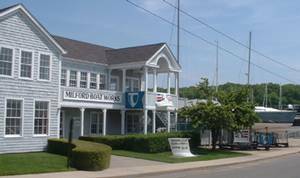 J. Kolkmeyer Yachts, LLC is located in Milford Harbor at the beautiful Milford Boat Works known for its services and ships store. This marine location is a short motor in from Long Island Sound, five (5) minutes from I-95 and the Merritt Pkwy and a short walk from the Milford Train Station. We are a full service Yacht Brokerage House offering Sales, Charters, and Yacht Management with a full range of power and sail boats, many of which are on site. We are members of the Yacht Brokers Association of America (YBAA) as such, our company and it's brokers conduct themselves by the YBAA Code of Ethics and Business Practices. Our brokers are CERIFIED PROFESSIONAL YACHT BROKERS (CPYB) reflecting their commitment to the highest professional standards in the industry. The CPYB designation is awarded only to qualified brokers upon succesful completion of an extensive exam which has set a benchmark measuring the experience, skills, abilities and performance of the individual broker. We pride ourselves in taking the time to listen to your needs and to what you want, both buyers and sellers. Buyers, we will help you find the "RIGHT" boat to fulfill a dream and start you on a great adventure! Sellers, we will work hard, put in that extra effort, keep you informed and make recommendations to help you with the results you desire. PLEASE ASK ABOUT OUR SPECIAL LISTING INCENTIVES! The BOATING SEASON is upon us. Finance rates are still low. Start a great adventure, fulfill a dream. Boating is a great lifestyle and a great way to bring family and friends together. Please give us a call, we would greatly appreciate the opportunity to help you find the "right" boat to fulfill a dream and get you started on a great adventure. If you are thinking of selling, more good inventory is needed and we have clients looking for a good boat. Give us a call to discuss the opportunities. SPEAKING OF INTEGRITY, the Shenzhen Lianghua Marine & Engineering Company (builders of the Integrity yacht line) was founded in 1981 and was the first to manufacture motoryachts, passenger ferries and speedboats in China. Now after more than 25 years, the company is the largest manufacturer and exporter of fiberglass commercial boats and luxury motoryachts in China. Shenzhen Jianghua Marine builds serious boats using advanced technologies, skillful workers and strict quality control. The company enjoys a very good reputation in the yachting world and has won the respect of many international customers. In the past 20 years the company has built more than 500 yachts for customers all over the world. We are now proud to introduce the INTEGRITY line of motoryachts ranging from 34' to 60 '. For more details and specification please click on Yachts for Sale and look at the 606 RPH, 526 RPH, 496 CE (ON ORDER FOR JAN.'07 DELIVERY), 426 ES (ON ORDER FOR MARCH '07 DELIVERY), 386 ES and the 346 ES. The Sydney 36CR is ready to deliver the ultimate sailing experience. The Sydney 36CR This eagerly awaited model follows the Sydney 39CR and 47CR, models that have made an impressive mark with interest at yachts clubs and in regatta's around the world, including Hamilton Island Race Week and arguable the toughest ocean race of them all, the Sydney to Hobart Yacht Race. 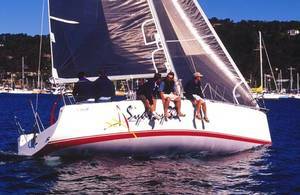 The Sydney 36CR is firmly aimed at the racing and club sailor, who appreciates the performance and construction difference of a Sydney Yacht. 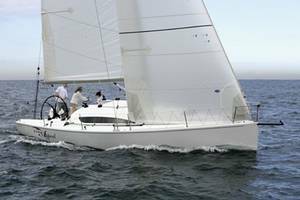 The Sydney 36 CR has the additional benefit of being a very stiff design with a high righting moment, non-overlapping headsails and a ton of interior volume fro a yacht of it's class.The 36 CR is exactly what the cruising/racer market has been looking for with no compromise to either racer or cruiser, and now with the availability of a shoal draft keel the yacht opens itself up to the Mid-Atlantic and S. Eastern United States as well. 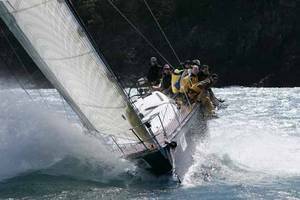 Sydney Yachts world recognized cruiser-racer range has been proven not only in the world’s premier blue water events, with victories in the legendary Sydney to Hobart, Fastnet and Transpac yacht races, but also in the rigors of charter fleets and cruising grounds around the world. The Sydney 36CR expands the internationally acclaimed Sydney Yachts range and makes it easier than ever to join the rapidly growing Sydney Yachts family. The Sydney 36CR is ocean ready. A one-piece GRP laminated structural grid incorporates the keel attachment, mast step, engine mount and rudder bearing for strength and durability and all sub frames and bulkheads are glassed into place. Exceeding ABS standards, the deck strength is the same as the topsides. Labor intensive to be sure but the result is a tough sturdy boat built to last, whether going to Hobart, in Sailing School and Charter use or just for the owner’s peace of mind. Built in Sydney Yachts modern ISO 9002 certified construction facility, the Sydney 32OD is constructed to comply with Waterways regulations for charter vessels. AFTER SALES SUPPORT and SERVICE. Sydney yacht owners have always been very strong in their praise of the excellent level of Sydney Yachts after sales support and service which has helped make their models such a great success. 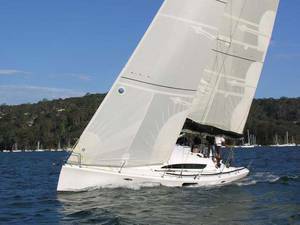 All Sydney yacht owners receive professional and friendly support and service. The support from the factory is one of the very strong reasons why WJKY is invloved with Sydney Yachts, that and of course the way the boats sail. This is a true Rule 90 boat! Special incentives for first North East USA Boat. Call for details. 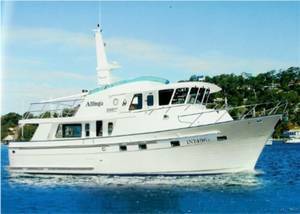 For complete specification on the full line of Sydney Yachts: 36CR, 39CR, 47CR and the 32OD and 38OD please click on yachts for sale and go to your boat of interest. Thank you for your consideration. Way back when...there use to be 89 official rules in sail boat racing. 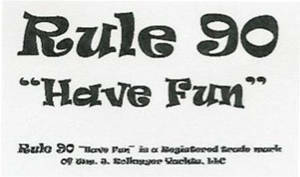 We and friends of like minds, believed there should be one more, "Have Fun", hence Rule 90. Many years ago, much more then most of us want to remember, we use to do a lot of sailing with a local legend on his Soveral 33, before we left the dock, he would always remember to tell us to "Have Fun", so we made it a rule...........the faithful still believe ! While boating, whether power or sail, cruising or racing, rememberRule 90 "Have Fun". 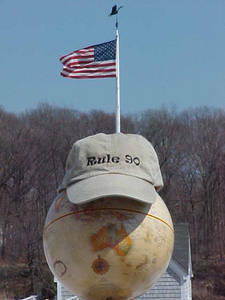 Whether "Down Under" or "On Top of the World", remember Rule 90 "Have Fun"
TEES: Rule 90 "Have Fun"
Add your boat name to any item, call for quote. "SIREN" sails under Rule 90 "Have Fun"
WATCH FOR NEW FUN ITEMS TO BE ADDED! The Nordic Tug 32 is a full keeled, semi-displacement cruiser who's classic tug boat profile and quality construction have endeared her to yachting enthusiast for many years. Indeed, with her plum bow, rounded stern, and false smoke stack the Nordic Tug 32 is unquestionable an eye catching design. SEA WOLF features the newer interior layout featuring a center line queen berth forward, large L-Shaped galley with under counter refrigeration, Two Air Conditioning units: 1 unit handles the main salon and galley areas and the 2nd handles the Pilot House and forward cabin), and a swim platform that extends the hull and water line length. Teak paneling and teak and holy cabin sole highlight the interior and the starboard side settee converts to a double berth for the occasional overnight guest. SEA WOLF also feature the upgraded 270 hp Cummins diesel. If you are in the market for a good cruising boat with classic good looks, you should come take a look at SEA WOLF, you will not be disappointed. Thank you for your time and consideration.